Come visit us Memorial Weekend for a special 4th Sunday show on May 28! This month we have another special fourth Sunday show over Memorial Weekend on May 28th. Take a break from your holiday festivities – and remembrance of our brave fighting men and women – and join us at the Arbutus Fire Hall from 9 am – 3 pm. Admission is always FREE! We have food on site, serving great breakfast and lunch options. Come by and search for some special music items. We have two pieces of great news! 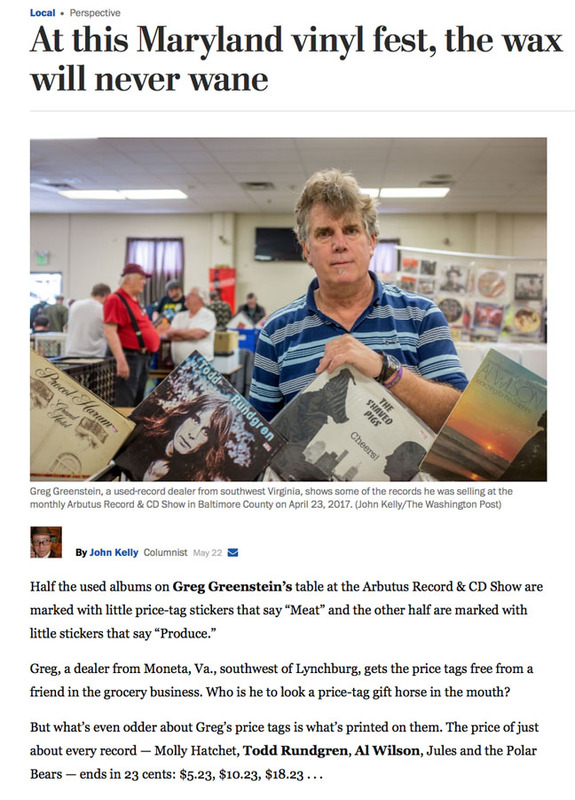 John Kelly wrote a great feature this week in The Washington Post, “At this Maryland vinyl fest, the wax will never wane” and you can view it here or on our Facebook page. It features two of our vendors Greg Greenstein and Tim Harris (he will be there!) Here are a couple of screen shots. 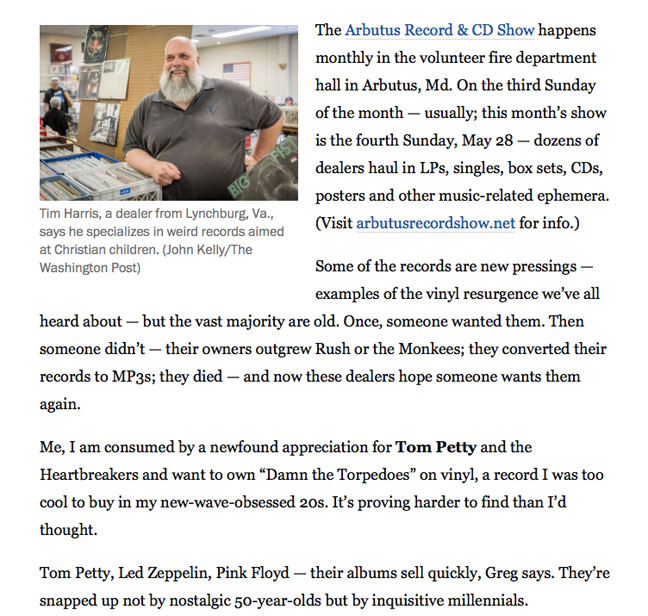 Our second piece of news…after a long absence, a very much missed vendor and all around nice guy will be returning to the show. We were so delighted to see him at last month’s show and thrilled that he will be here this Sunday. 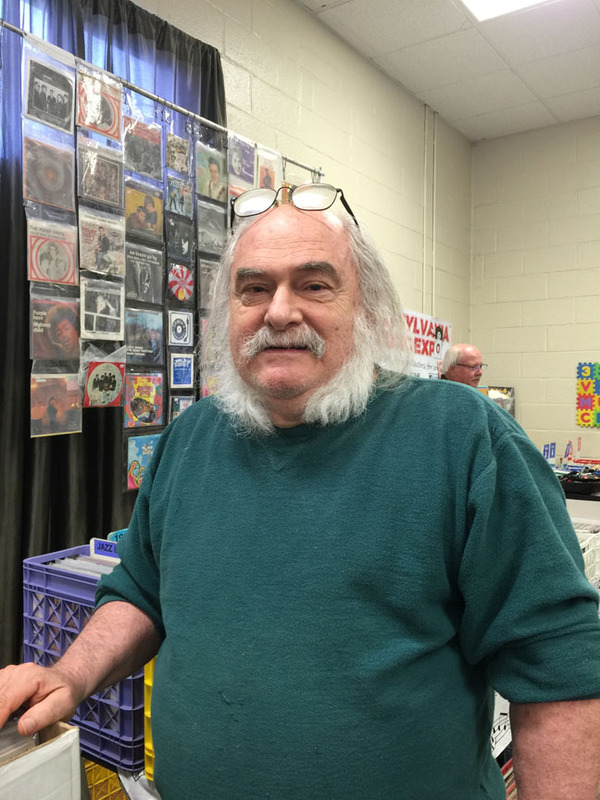 Stop by and visit Al Ercolani at his booth to welcome him back.